Dybala has scored 50% of Juventus’s goals so far this year. His number of shots is 83% higher year-on-year and his goal conversion rate has almost doubled, to 22.2%. There is a problem though: the performance stats drop significantly when playing in the European Champions League. In order to go “to the next level”, he would need to improve in Europe. Doubling the amount of shots, tripling the number of goals: is that sustainable? In the past three seasons (of which two playing for Juventus and one for Palermo), Dybala has averaged 3.6 shots per 90 minutes. In the current season, he has taken 6.3 shots every 90 minutes, equally split between the ones taken from outside and inside the penalty area. Dybala’s shot accuracy (percentage of shots on target) has increased to 42.2% this year, from 36.6% last year. The big question is whether this is enough to justify the improvement he had in terms of goal conversion, which went from 13.4% last season to 22.2% this year. Specifically, the stats show quite a surprisingly high goal conversion rate for the shots taken from outside the box this year (13.0%). He scored 3 goals out of 23 shots (2 free-kicks and the goal vs Sassuolo shown in the GIF). We believe this is unlikely to be sustainable over the long-term. In the previous three years, the goal conversion rate of the shots taken from similar positions averaged c.7%. The number of goals per 90 minutes has tripled, from 0.46 last year to 1.39 during the current season, as a result of many more shots and a higher shot accuracy. But we wonder if the ongoing scoring rate could continue. 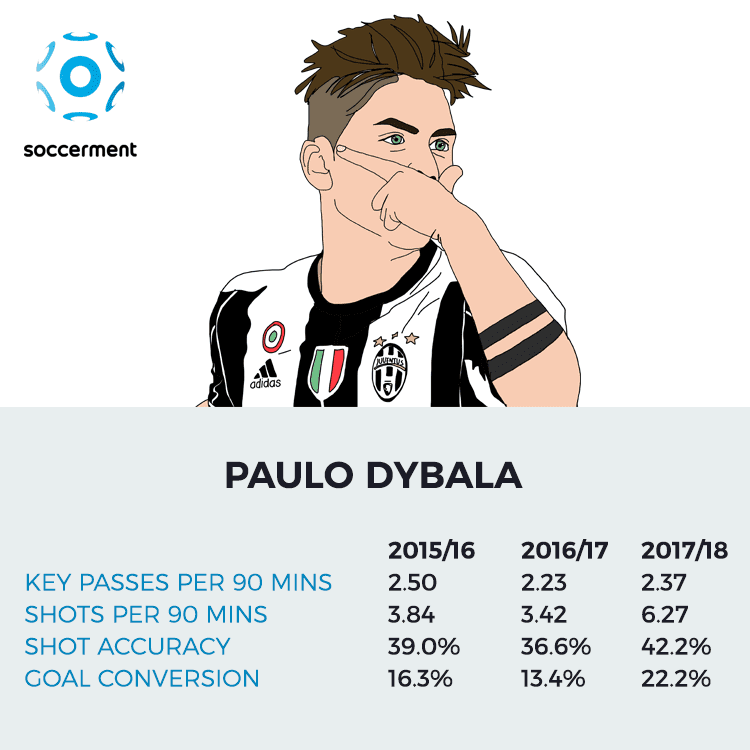 We have looked at the performance stats of Paulo Dybala related to the past three seasons, breaking them down between the ones in the Italian Serie A (‘ISA’) and in the European Champions League (‘UCL’). Finally, the number of goals per 90 minutes moves from 0.71 in ISA down to 0.32 in UCL. In 2016/17 UCL, Dybala played 11 matches, for a total of slightly less than 800 minutes, during which he scored 4 goals and did not serve any assist. We believe that, in order to reach “the next level” and being recognised as a “top player”, the performances in UCL would need to greatly improve. That would clearly increase Juventus’s chances to win the competition. Gonzalo Higuain has not started the season in the best possible way. He has scored three times (2 in ISA, 1 in UCL), out of the 19 shots taken, of which 15 in ISA and 4 in UCL. The number of shots has decreased by 30% compared to the average of the previous three seasons (3.1 vs. 4.4 P90). 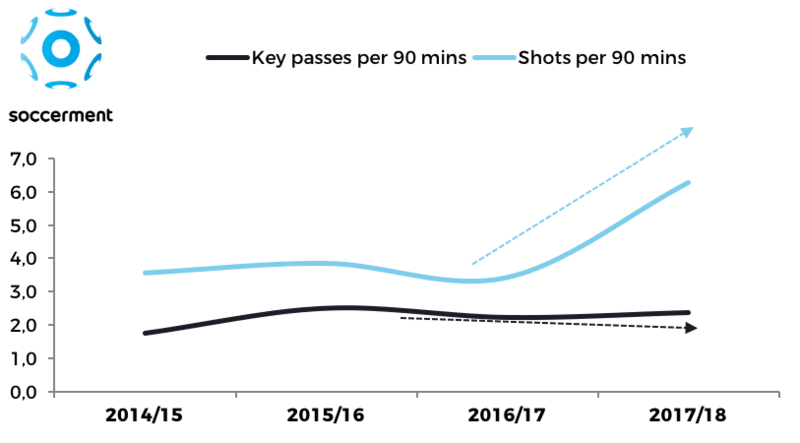 This might have to do with the shooting attitude of Dybala, until last year more prone to pass the ball to Higuain, whilst now more keen on shooting. Whilst the initial conclusion seems to be that Dybala is “stealing the scene” from Higuain, the reality seems to be somewhat different. 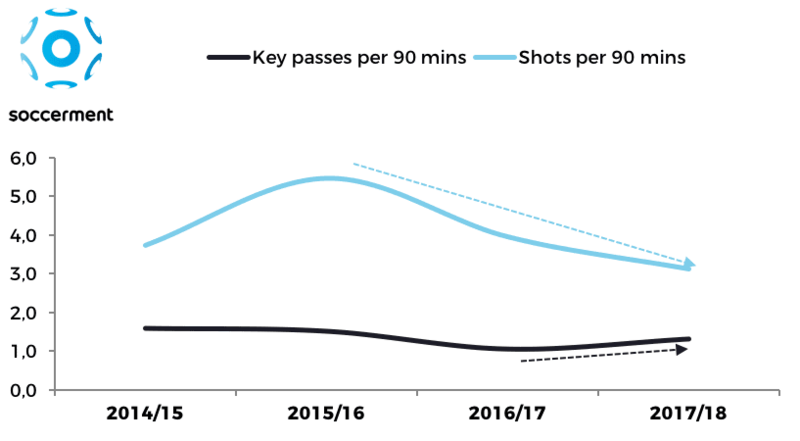 First of all, Higuain’s shot accuracy has declined significantly, to 36.8% from 45.2% average in the previous three seasons and, as a result, his goal-conversion rate dropped to 15.8% this year vs 17.6% in the previous three seasons. 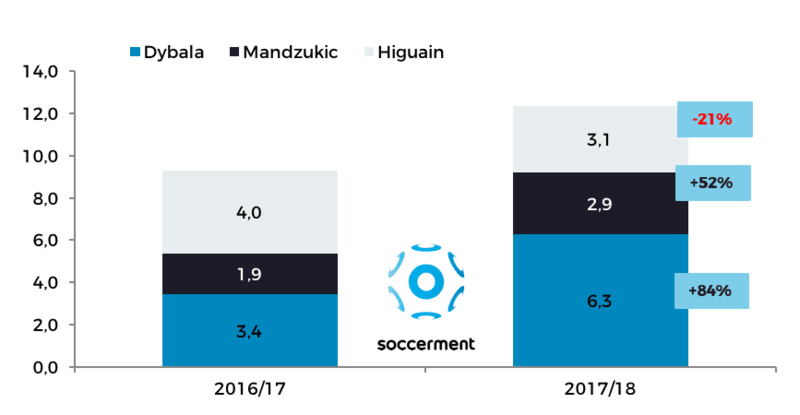 Secondly, if we include Mandzukic in our analysis, we can appreciate that the combined number of shots of Juventus’s trio has improved year-on-year (+33%) and that Mandzukic’s number of shots has increased by 52% year-on-year. All-in-all, we do not believe that Higuain’s sub-optimal start of the season has much to do with Dybala’s growing influence over Juventus’s attack. It seems to us that it was just a period of poor form for Higuain, which has maybe ended with yesterday’s UCL goal against Olympiacos. In our 2018 top scorer preview for ISA, we indicated Higuain as one the main contenders and we remain of that idea. In the past few weeks, we have often heard the media comparing Dybala to Messi. Dybala will be 24 year-old in mid-November. When 24 year-old (2011/12 season), Lionel Messi scored 64 times between Spanish La Liga (‘SLL’) and Uefa Champions League (‘UCL’), setting the new record for SLL’s number of goals (50). Messi’s number of shots in 2011/12 amounted to 5.9 every 90 minutes. His shot accuracy was 48.6% and he had a goal conversion rate of 23.0%. In that season Messi was also able to serve 21 assists in total (SLL and UCL), completing 2.6 key passes per 90 minutes.